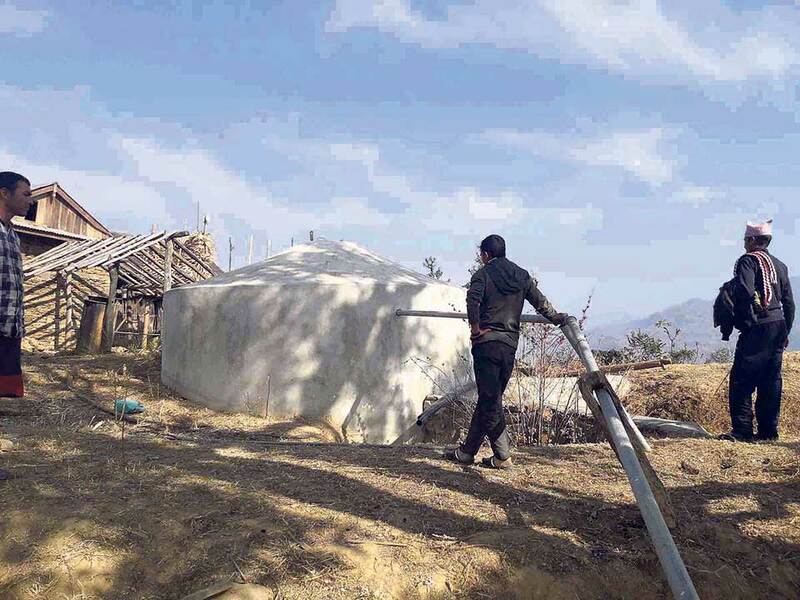 KATHMANDU, Feb 25: The Rasuwa-Kalapani Drinking Water Project of Khotang is nearing completion. Nearly 90 percent of the work at the lift drinking water project has been completed so far. The project will lift water from Sunkoshi River 1,800 meters higher to Kalapani village which is reeling under acute shortage of drinking water. Construction work, which began in April 2016, is expected to be complete in few months. The project will cater to everyday needs of more than 500 people living in the locality. The estimated cost of the project is Rs 18 million. The project will have two supply tanks having capacity of 10,000 liters each and a 35,000 liter tank at the top of the village. Karna Bahadur Raut, president of a consumer committee formed by locals said that the work to lay down 50 mm GI pipe from the boring site on the riverbank to the village has already been completed. “We have completed major works like installation of water pump, construction of supply tanks and installation of pipeline. Now, we need to install 36 electricity poles between the boring site and the main tank,” he added. According to Raut, 12 poles and electricity wires have already been transported to the construction site. The electrification work is estimated to cost Rs 1.94 million. Parched locals believe that the project would ensure smooth availability of drinking water that was affecting life of entire residents of the village. The detailed survey of the project was done in 2013.